Big or small, in the Eastern Appalachians or the Rocky Mountains, trout are the fly-rodders favored quarry. I signed a contract to teach out of town, sealing the fate of my marriage. My son Patch was along, offering his own brand of moral support, patient while I visited the hospital for the drug test and talked with a realtor who gave me the lowdown on the local market. He sipped his Italian soda and read from a posthumously published gothic novel by the late kid’s genius John Bellairs, speculating on possible plot outcomes as I nursed my French roast and scanned the classifieds for apartment or condo options. One moment we were all business, preparing for our uncertain future. The next we simply looked at each other and agreed we were done for the day, enough was enough. The Dalles. Dufur. Friends. Tygh Valley. Less than an hour from our new home, we passed beneath the railroad bridge and looked directly into Sherars Falls, that terrible chasm that claimed a cousin’s life and no doubt countless more. A native fisherman lay squeezed into shade at the edge of his rickety Dr. Seuss platform, the long handle of his dip net standing upright like a predawn flagpole. Just before the gravel, we could see the extent of the much-ballyhooed low water: skeletal bedrock and scattered freestone lay revealed like veins of a wizened leaf. 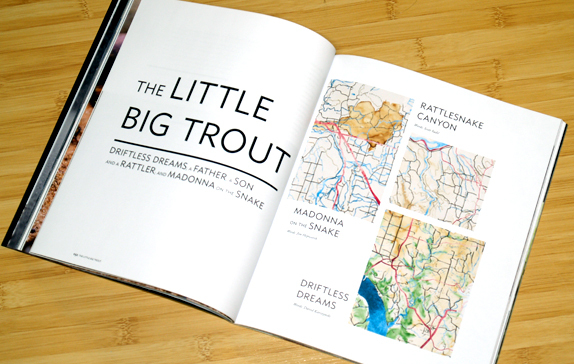 Surely we can agree on this much: each species of trout has its own virtues. Still, they were here first, as a poet points out, and yet few of us can even agree on what color they are. Sunlight gold? Dark copper? Is that hue on their backs green or olive? Are their bellies pink or scarlet? Does their skin, like the skins of their cousins, the rainbows, really exude a purple haze in places? And what about that characteristic slash under the jaw, or, rather, the lower mandible? Is it actually lipstick orange? And those black flakes splashed across their tails and their wrists and backs? Black, yes, but how black? Ink-black? Boot-black? More like pepper, of course, in most of the 14 subspecies, but usually large, individual flecks, not the diminutive spray of finely ground pepper, except on the Snake River fish that used to be all the rage in Jackson Hole. Honestly, I don’t care if it rains or freezes. You can keep your plastic Jesus. Just give me the cutthroats, the master race, those most western of western trout. I crawled out from my tent smack into a cudgel of sunshine. Damn, I thought. I hung there for a moment with a hand on my eyes, hoping my senses were somehow amiss. That the sun on my neck wasn’t really so hot. That the grass in my fist wasn’t really so dry. That I hadn’t just committed the only sin in sight—that of sleeping through the morning on the last day of trout season. But how late was it? A few feet from my head, at the edge of my tent’s shadow, a pistachio grasshopper clung to a thick wand of grass. The hopper, I knew, by the length of his leap when I tapped his bottom, would tell me how many miles the dawn had put behind it. But I was still knuckles away when the hopper, baked to limber alertness, launched himself into the next galaxy of grass. I sighed. The dawn was way out west. Spry ocean breakers lapped it up. Here, in the heart of Wisconsin’s Driftless country, the springs creeks chewed the cud of afternoon. Subscribe to see the entire piece.